As a scrappy small business, you don’t have unlimited resources. You have to work even harder than big businesses to stay in the game. Whether you’re finding ways to save time, money, or to get the most out of team members, a CRM is a small business marketing tool that can open doors for your business. Here are four ways that a CRM for small business can make you more competitive in a landscape dominated by big businesses. The perpetual advantage that smaller businesses have over larger businesses is that they are much closer to their customer base. When customers shop at a small business, they receive a more personal experience. They may receive expert, niche advice that they wouldn’t get working with a larger business. They may know the owner by name, and know the background story of the business. Or, they may have a personal relationship with their account manager or sales rep. These little details set the small business purchasing experience apart. Many buyers, especially Millennials, care about the entire purchase experience -not just the act of purchasing. The tough part for small businesses is maintaining that personal touch in a scalable way so they can impact more customers. A small business CRM can provide that level of guided personalized experience throughout the entire funnel: send customers to custom website content, automate email campaigns tailored to each segment of your customers, and use the central database information of customer interaction and behavior to make productive, personal sales calls. When the routine stuff is tracked and automated, you open up more time to focus on building important relationships that drive your business. According to Customer Think, most businesses suffer from the worst of both worlds: marketing and customer service specialists are spending more than 20 hours a week doing things like data entry, while 79 percent of data still does not get updated properly. A CRM for small business automatically gathers and updates important customer data in real-time. This means your staff has time back each day and each week to be more productive and innovative. Additionally, the more comprehensive customer data provided by CRM means that every customer service staff member has instant access to things like the history of this customer’s calls, his website and email habits, and so on. Not to mention, when you automate data entry, you can drastically cut down on bad information that dirties up your database. With tidy records, the next time a customer calls in, you can swiftly pull up their information, get a history of their account at a glance, and deliver a solution right away. Or when the sales team runs their next promo, you can easily notify customers that bought something similar in the past. At the end of the day, your business can deliver a stellar customer service experience, all while your big business competition down the road is treating customers like they are just an anonymous number. Understandably, small businesses often focus on their customer segments that they already know and understand. However, one of the powerful benefits of CRM for small business is that it may help you discover potential buyers you were unaware of. For instance, CRM lets you get information on who is visiting your website (once they’ve engaged with it), which pages they were interested in, how often they have visited, and so on. You may discover that your product appeals to a demographic or market segment you had previously overlooked, all while using this same technology to better monitor the changing tastes and habits of your existing customers. As a small business, it’s important to grow your customers, and CRM lets you do so while nurturing your loyal customers. Small businesses rely on repeat customers to survive and thrive. That is easier said than done, however: 91 percent of the customers who switch to a different company or brand do so without indicating what they were unhappy about with the original business. However, CRM allows you to hold onto more customers while also allowing you to do an in-depth postmortem of the accounts that get away. For instance, the centralized CRM database allows you to track the lead source of customers – for instance, may there is a sales or marketing channel that tends to send buyers that don’t stick. You can also track the reason a customer has left. This information allows you to predict those who are at the highest risk of leaving and to reach out to them with more individualized attention and care. On the positive side, this information works the other way, too: you can analyze the habits and experiences of your most steadfast and loyal customers and discover what you can do to bring that level of satisfaction to more of your customers. 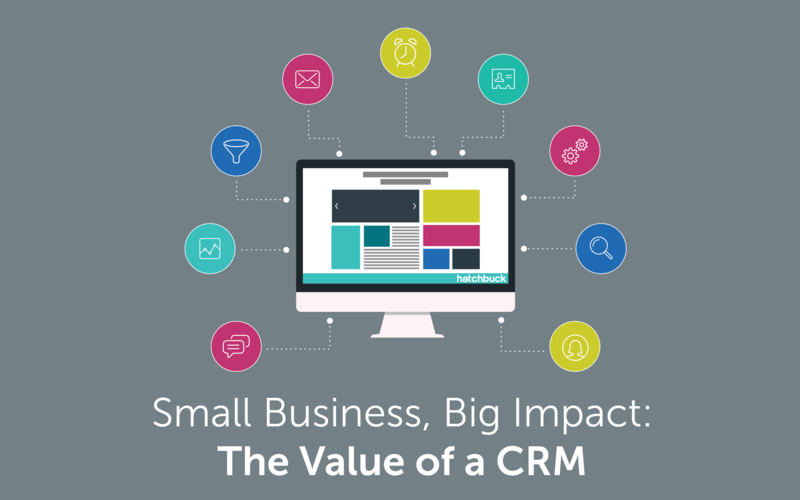 CRM is a crucial tool for small businesses. With the right CRM technology for your business, you can scale a personalized experience, delight your customers, uncover new opportunities, and create raving fans. Is Your Small Business Suffering a Holiday Slowdown? This Might Help.